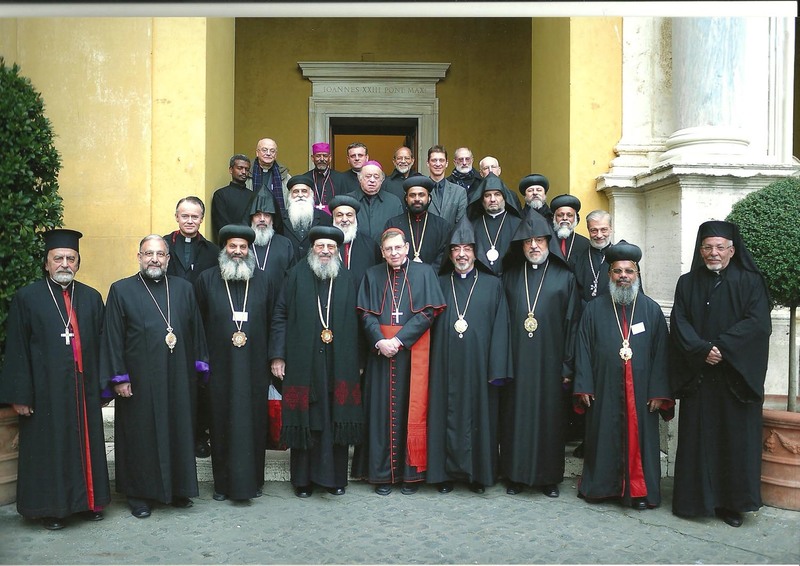 The eighth meeting of the International Joint Commission for Theological Dialogue between the Catholic Church and the Oriental Orthodox Churches took place in Rome from January 25 to 28, 2011. The meeting was hosted by His Eminence Cardinal Kurt Koch, the new President of the Pontifical Council for Promoting Christian Unity. It was chaired jointly by Cardinal Koch and by His Eminence Metropolitan Bishoy of Damiette, General Secretary of the Holy Synod of the Coptic Orthodox Church. Joining delegates from the Catholic Church were representatives of the following Oriental Orthodox Churches: the Antiochian Syrian Orthodox Church, the Armenian Apostolic Church (Catholicosate of All Armenians), the Armenian Apostolic Church (Holy See of Cilicia), the Coptic Orthodox Church, the Ethiopian Orthodox Tewahido Church, and the Malankara Orthodox Syrian Church. No representative of the Eritrean Orthodox Tewahdo Church was able to attend. At this meeting, the members continued their study – in a very friendly atmosphere – of the ways in which the churches expressed their communion with one another until the middle of the fifth century and the role played by monasticism in this. The papers presented included “The Communion and Communication that Existed Between Our Churches Until the Mid-Fifth Century of Christian History As Well As the Role Played by Monasticism: The Tradition of Antioch,” by Archbishop Theophilus George Saliba; “The Petrine Office and the Question, Who Established the Church of Rome? : Coptic Orthodox Perspective,” by Metropolitan Bishoy of Damiette, “Communion and Communication Among the Churches in the Tradition of Alexandria,” by Father Mark Sheridan, OSB; “The Role of Monasticism in the Development and Communion of the Churches,” by Father Columba Stewart, OSB; “Communion and Communication that Existed Between Our Churches Until the Mid-Fifth Century of Christian History and the Role Played by Monasticism: The Ethiopian Experience,” by Archdeacon Daniel Seife Michael Feleke; “The Reception of the Ecumenical Councils in the Armenian Tradition (VIII-XV cc. )” and “Communion and Communication,” by Archbishop Yeznik Petrossian; “Communion and Communication Between the St. Thomas Christians of India and Other Churches till Mid-Fifth Century A.D. – Indian Orthodox Perspective,” by Metropolitan Dr. Gabriel Mar Gregorios; “Communion and Communication Between the St. Thomas Christians of India and Other Churches till Mid-Fifth Century A.D. – A Syrian Orthodox Perspective,” by Metropolitan Dr Kuriakose Theophilose; “Communion and Communication Among the Churches: Rome in the Pre-Constantinian Era,” by Prof. Dietmar W. Winkler. In these various studies, the members of the commission focused more precisely on the concrete expressions of communion and communication among the churches before the separation. Indeed, communion was expressed primarily through various forms of communication. It was noted that in the pre-Constantinian period, there was an intense communication among the churches, especially in times of crisis. There was a common sense of responsibility towards the other churches that was found most clearly in the exchange of letters and synodal decisions. These provided a means of conveying encouragement and challenge to one another, as well as theological clarifications. This exchange was mutual among the various churches. It exemplified a remarkable degree of communion among local communities in a process that lacked central direction after 250 years of expansion throughout the Roman Empire and beyond, including Armenia, Persia, Ethiopia and India. The universal phenomenon of Christian asceticism, present from the earliest times, found expression in the monastic movements, emerging from the late third century in all parts of the Christian world. There was a fruitful exchange of monastic spiritual writings emanating from the Christian Orient, even across doctrinal divisions. In the evening of January 25, the members attended a Vespers service in the Basilica of Saint Paul’s Outside the Walls presided over by His Holiness Pope Benedict XVI for the conclusion of the Week of Prayer for Christian Unity. In his homily the Holy Father made reference to the presence of the members of the dialogue, and said, “We entrust the success of your meeting to the Lord, that it may be another step forward towards our longed-for unity”. On Thursday evening January 27, Cardinal Koch hosted a dinner for the dialogue members and staff of the Pontifical Council for Promoting Christian Unity at the Domus Sanctae Marthae in the Vatican. The ninth meeting of the International Joint Commission will take place in Addis Ababa, Ethiopia, at the invitation of His Holiness Abune Paulos I, Patriarch of the Ethiopian Tewahido Orthodox Church. The members will plan to arrive on Monday January 16, 2012, and depart on Monday January 23. The two delegations will meet separately on Tuesday January 17, and in plenary session on Wednesday, Thursday and Saturday, January 18, 19, and 21. They will participate in the celebration of Epiphany (Timkat) on January 20, and in Sunday liturgies on January 22. The members concluded with joyful thanks to God, the Father Son and Holy Spirit, for what has been accomplished at this meeting. Malankara Orthodox Syrian Church: H.E. Metropolitan Dr. Gabriel Mar Gregorios, President of the Department of Ecumenical Relations, Diocese of Trivandrum, India; H. G. Metropolitan Dr. Youhanon Mar Demetrios, Assistant Bishop of Delhi (co-secretary), Delhi, India. By A.J. Boyd in Theology and Ecumenism on February 20, 2011 .